Acid reflux is properly called Gastro-Esophageal Reflux Disease, or GERD. In GERD, acid escapes out of the stomach and into the esophagus, the tube which delivers food down to the stomach. This is a problem: while the stomach has a strong lining to protect itself from corrosive acids, the esophagus does not. Even relatively mild acid can damage the delicate esophagus. – and the question that everyone seems to overlook! – is exactly how acid manages to escape out of the stomach in the first place. As it turns out, there can be two causes: 1) The valve at the top of the stomach is weak or lazy, and allows acid to escape; or 2) Even when the valve is healthy, pressure in or on the stomach squeezes acid out. Quite often, it is a combination of these two. Notice that nowhere here does it say anything about the stomach being too acidic. That’s because nowhere in the scientific literature does it say that excess stomach acidity causes GERD. (In fact, if anything, low stomach acidity may cause GERD – more about that later). Still, if antacids and acid blockers make you feel better, why not use them? The answer lies in the side effects. Lowered stomach acidity has been linked to: asthma, osteoporosis, candida yeast overgrowth including vaginal yeast infections, kidney stones, food allergies, inflammatory bowel disease, ulcers, gas and bloating, bad breath, a red nose and cheeks (in non-alcoholics), weak fingernails, eczema, psoriasis, rosacea, adult acne, arthritis, increased susceptibility to food poisoning, and stomach cancer. But that’s not all. Lowered stomach acidity also compromises your ability to absorb certain drugs, including thyroid hormones, aspirin, and some antibiotics. But that’s not all. Lowered stomach acidity impairs your ability to digest and absorb practically every nutrient in food. And insofar as vitamins and minerals protect you from disease, antacids and acid blockers can indirectly increase your risk of practically everything! Many people believe that GERD is actually caused by a deficiency of stomach acid, and this makes a certain amount of sense. If the stomach juice isn’t acidic enough, the body compensates by simply producing more of it. So the stomach fills up, the contents press up against the valve, and there you go: reflux! (Even when the stomach juice is too weak to effectively digest food, it can still be strong enough to damage the esophagus). Some estimates have it that 90% of people with GERD are actually suffering from a stomach acid deficiency. If you want to read more about this theory, I strongly recommend the book Why Stomach Acid is Good for You, by Jonathan Wright and Lane Lenard. Obviously, lowering stomach acidity does alleviate the symptoms of GERD, the burning and pain. And it can address a more serious consequence of the disease: the increased risk of esophageal cancer caused by chronic damage to the esophagus. Since esophageal cancer can be fatal, you should probably do whatever it takes to prevent it, including lowering stomach acidity. But wouldn’t it be great if there were another way, something that didn’t have all the long-term problems? First, some basic lifestyle advice. Stay upright a few hours after eating. If you lie down after meals, the stomach contents may wash up against the valve at the top of the stomach. You may also try elevating your head while you sleep, using pillows or an adjustable bed. Even though many spicy foods are good for digestion (think: turmeric, ginger), they may make reflux worse in the short term. Also avoid fried foods and other heavy, hard-to-digest items such as sausage and unsprouted nuts; tomatoes, raw onions, garlic, coffee, alcohol, and mint. (Many people will still want to take mint to help with irritable bowel syndrome/spastic colon. The thing is, mint works by relaxing the muscles it comes in contact with along the digestive tract. So while it’s great for intestinal spasming, it also relaxes the valve at the top of the stomach, letting acid out. You can still take mint, just look for an enteric-coated product, which won’t start working down until it gets past the stomach). pregnancy, coughing, hiatal hernia, obesity, and tight clothing around the waist or belly. And address chronic constipation: it not only increases pressure on the stomach, but can hold up the sequence of food moving through the digestive tract. There are some supplements which can be also be very helpful. In terms of just general digestion, it’s worth looking at digestive enzymes and bitters. Digestive enzymes help break down food and are probably the best all-purpose aids to digestion. If you have any minor digestive problem, from reflux to gas and bloating, constipation, lactose intolerance, or just plain stomach aches after meals, try enzymes. Bitter herbs are a traditional remedy. They stimulate the body’s own digestion reflex. In treating GERD, some people actually work to increase acidity in the stomach. And this certainly makes sense, considering how insufficient stomach acidity can cause GERD. To be honest, though, there isn’t much solid, clinical research to back up this approach. Nevertheless, enough people say that it works for me to believe that it could be valid. If you have GERD, especially if it’s combined with some of the other symptoms of low stomach acidity, you might want to take acid supplements. The old-fashioned method is to drink a tablespoon or two of raw apple cider vinegar in a glass of water before meals. While this can be effective, it may also irritate your esophagus on the way down. If the vinegar bothers you or is inconvenient, you may opt for hydrochloric acid (HCl) pills instead. Start with one capsule per meal. Then after a few days, move up to two, then three, etc. Keep on raising the dose until you start to notice the first twinge of discomfort, usually a warm feeling in the stomach. This means you’re taking too much, so back it down a pill or two. Stop it if it makes things worse. Do not take acid supplements if you have an ulcer. And of course, it’s silly to take acid and antacids at the same time. If you like the idea of this approach but are already on antacids or acid blockers, discuss it with a qualified healthcare professional, someone who understands both the acid pills and the antacids. These herbs, which we often see in throat lozenges, have names like marshmallow root and slippery elm bark, and can help with their soothing effect on the stomach lining. Aloe Vera juice is also good. In addition to soothing irritated skin, there are components in aloe which stimulate healing. Finally, there’s one product I’m extremely excited about, called “Heartburn Free,” from the Enzymatic Therapy company. Reading the brochure for it, it sounds too good to be true. But in the year or so we’ve had it, we’ve gotten very, very, positive feedback. I won’t go into it too deeply because I’m running out of space, and because we have a very informative, very honest pamphlet on it which you can come in and get. 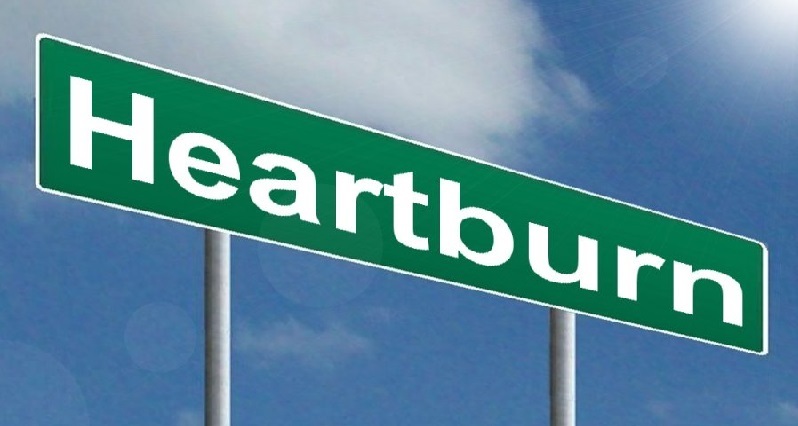 Simply put, Heartburn Free is a capsule of a specially-prepared orange peel extract. You take one, every other day, for 20 days. Then you can stop taking it, and it keeps working, usually for 3-6 months! It doesn’t lower stomach acidity and it doesn’t interfere with digestion. It helps in the vast majority of cases, and there’s a money-back guarantee for when it doesn’t. Side effects? Well, there’s some evidence that orange peel extract may have anti-cancer properties as well. This is the most impressive “brand new” product I’ve seen in years, for reflux or anything else. No kidding. In gastric ulcers, a portion of the stomach’s protective lining erodes, exposing the sensitive tissue underneath. Just like in GERD, lowering the acidity in your stomach can make you feel better. And just like in GERD, this can make things worse in the long-term. We know that the bacterium, Helicobactor pylori, causes the majority of ulcers by colonizing the stomach lining. And H. Pylori thrives in a low-acid stomach! The mucilaginous herbs and aloe vera mentioned above can be useful here as well. Look at the aloe-and-herb combination product called “Stomach Formula” put out by the Naturade company. Licorice in the form of DGL (deglycyrrhizinated licorice) can be very helpful. Repeated studies show that DGL not only makes people with ulcers feel much better, but also increases the stomach’s ability to heal and protect itself. (DGL, as opposed to regular licorice products, doesn’t raise blood pressure). This is an excellent product, and useful for “mouth ulcers” (canker sores) as well! Finally, there are two supplements that kill H. pylori. Propolis is an antibacterial resin gathered by bees to protect their hives from infection; mastic gum is a similar resin, just directly from trees, without bees as “middlemen.” Both not only kill the bacterium, but may promote healing as well.